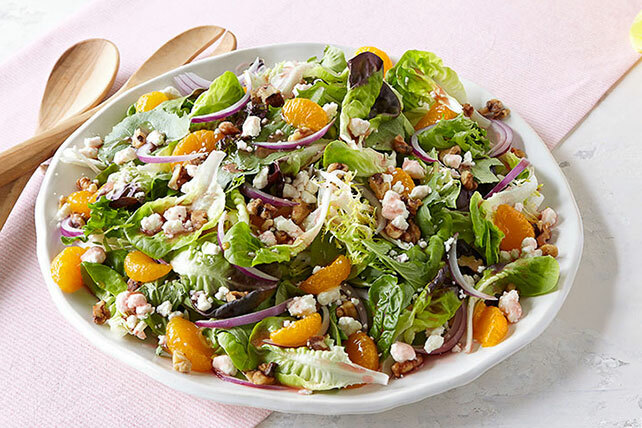 Tart, sweet fruit and tangy feta cheese are tossed with greens, red onions, walnuts and reduced-fat raspberry vinaigrette for a refreshing side salad. Serve this refreshing salad with a piece of grilled fish or poultry and a side of hot steamed vegetables. Spread nuts into single layer on rimmed baking sheet. Bake in 350ºF oven 7 min. or until lightly toasted, stirring occasionally.